This article was written in 2012 – nowerdays the plugin offers much more features and a new syntax, please refer to the plugin’s wiki pages here for up-to-date information about features, usage etc. Simply open an issue, click on Create multiple Subtasks from the issue operations menu and type multiple lines – one for each issue. Just take a look at the following screenshots and the screencast on YouTube. 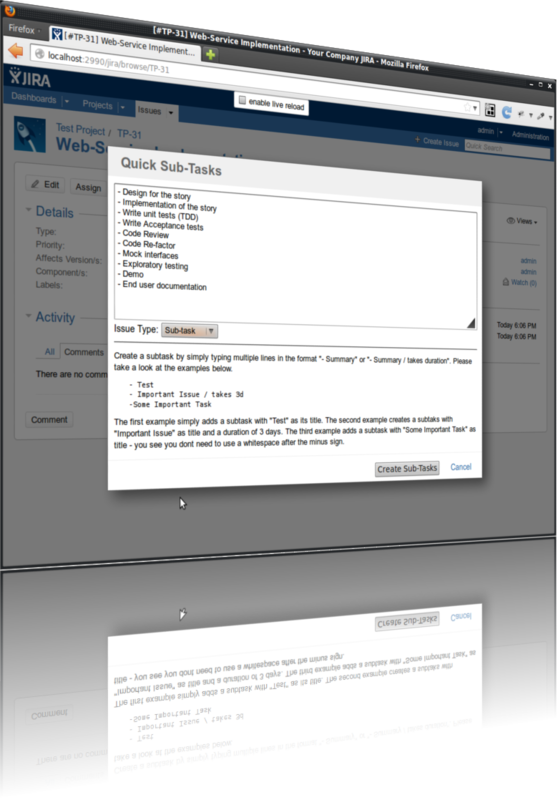 The following screenshot shows the data entry screen that allows you to write down multiple subtasks. 2015-01-13: I have added a note to reflect that fact that this article is outdated. This entry was posted on Tuesday, August 21st, 2012 at 6:42 pm	and is filed under Jira. You can follow any responses to this entry through the RSS 2.0 feed. You can skip to the end and leave a response. Pinging is currently not allowed. Nice! Does it tell me if I’ve spelled “/ takes” wrong, so I know I have to go back and fix some of the subtasks? I guess that’s also related to asking if the action creation is atomic. Thank you so much for the wonderful plugin. We have a very complex scenario of creating hundreds of sub-tasks on 7 different issue types. I have been trying to use a workflow post-function to trigger the multiple sub-tasks templates – but there is no condition to specify the parent issue type. Am I doing something wrong or is there a way in which you can think of getting this to work? But it doesn’t inherit the values for all fields except for Component/s. Is there anything that I might missed entering here? Please let me know. Secondly, just like multiple sub-tasks of same type getting created is there a way to create various types of sub-tasks at one go?? Would be nice if any of you can respond at the earliest. Hi, you plugin has been a huge help for us, do you have any intention of porting it to JIRA online? When I click on Add Multiple Sub Tasks, Jira asks me if I want to Open or Save a JSON file. I do not see the screen shown in your demos?